Chapter 6 is Utilize A Smart Guide. The authors admit they struggled to come up with a neutral, all-encompassing term for the person who is charged with leading a peer advisory group. The leader of an effective peer advisory group needs to be smart and seek the guide the group so they came up with the term smart guide. 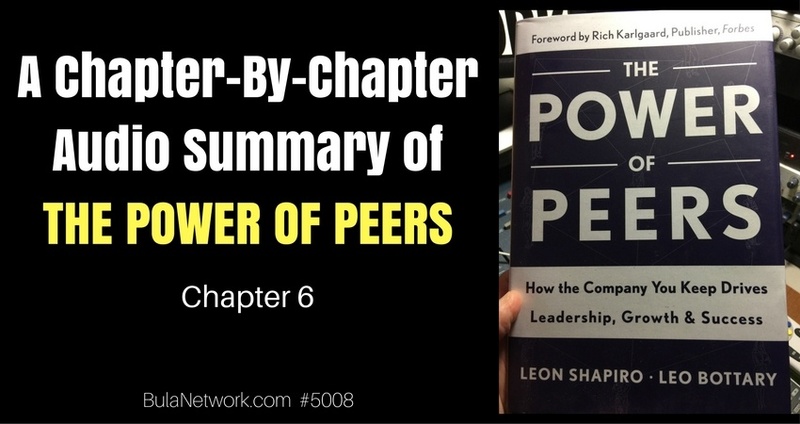 The point of this chapter isn’t to teach somebody how to be a smart guide, but rather to allow members and prospective group members to gain insights into how these groups operate and why effective guidance is so critical to maximize the potential of the group. Co-author Leon Shapiro begins the chapter with the story of a business owner – actually a co-owner with his brother – of a business that had recently discovered a serious inventory issue. The chairperson of the group had some insight about the relationship of the two co-owners, brothers. When the issue was brought before the group, the chairperson asked questions that prompted deeper discussions about how the two brothers approached running the business. By having a smart guide help navigate the discussion, the business benefited more fully from the support of the peer advisory group. What does great peer advisory group leadership look like? The challenge is simply stated – how can you help your members be at their best both inside and outside the group meeting, professionally and personally? At the top of the list is having a passion for the work. The authors talk of a group leader named Pat who died in 2013 at the age of 98, still actively leading his groups. Many of the members had been with him for more than a decade. His passion was evidenced by remaining engaged in the work as he approached the century mark of life. The interesting note is that he didn’t start until he was 73. That means he enjoyed doing the work for almost 25 years. Pat regarded it as the most meaningful work of his life. He wasn’t just helping CEOs. He was helping create jobs, helping families buy houses, helping companies support non-profit causes – work that went well beyond the top or bottom line of a company’s performance. Bula Network was formed when I left the C-suite after having run a company for almost 20 years. As Tom Petty sings, it was time to move and time to get going. Time for a new chapter. That was back in 2008. Mostly, I wanted to help other businesses by way of consulting. That morphed into coaching, which introduced me to the idea of peer advantage. Having never been involved in the formal work of peer advantage, it immediately clicked with me. I knew I was wired ideally for the work so I set about to learn all I could. That was over 2 years ago. That led to me connecting with Leo Bottary, a co-author of this book. Which led to me urging him to start his own podcast…which he did, YEAR OF THE PEER. All the while I was desperately wanting to enter this space, even if in some small way. And to do it the way I felt was most suitable for the people I really wanted to serve – small to medium sized business owners. I’ve worked with many CEOs and executives, but there’s something unique about owners. They’re operators. They’re close to the work. They have a point-of-view that resonates with me. I’ve been in that world since I was young. My passions began to intersect – my passion for small to medium business coupled with my passion to help facilitate deep conversations where problem solving and taking advantage of opportunity could be enhanced. That’s how The Peer Advantage began…and why I’m now full-throttle ahead in seeking out SMB owners who want to experience the tremendous value of the peer advantage. The peer advantage resonated so deeply with me because if faced with door number 1, which I could enter and engage a room full of hundreds of people, many of whom are famous and exciting…or door number 2, behind which are 7 complete strangers who will engage in deep conversation where we can get to know each other…I’m picking door number 2 every single time! That also explains why I’m not attempting to build larger groups…I want to form groups of just 7 so conversations and progress can happen more quickly and relationships can be forged that will positively impact every member of the group. In addition to passion, another common component of effective peer group leaders – aka smart guides – was servant leadership. Robert Greenleaf coined that term in 1970 in his essay, “The Servant Leader.” Leo interviewed Kent Keith who served as CEO from 2007-2012 of what is now called the Robert K. Greenleaf Center. Kent told Leo how servant leadership came to be. Mr. Greenleaf worked at AT&T before retiring after 38 years in 1964. Toward the end of his career he was director of management research, training senior leaders for the company. After he retired he concluded that the power culture of leadership he had known at AT&T didn’t work well. He saw a better way – servant leadership. In his model the employees weren’t there to make the leader successful, but the leader was there to provide resources and guidance to help the employees be successful. Take passion, add to it the servant leadership spirit and let’s add to it being a good listener. That means more than hearing the words. It requires the ability to hear and understand what’s being said. You can best know what someone’s true needs are when you’re able to listen and understand them. Let’s pile on another component – the ability to get to the heart of somebody’s needs. That requires asking good, even great questions. Susan Scott wrote a book entitled, “Fierce Conversations.” In the book she describes the 7 steps to fierce conversations. In chapter 7 of THE POWER OF PEERS we’ll learn more about how to ask good questions. The best group leaders think of themselves as coaches, not consultants. Consultants are problem-solvers who recommend solutions while coaches help you reach your own conclusions. My career over the past decade has morphed from consulting to coaching so this progression to becoming what the authors call “a smart guide” is fitting for my experience, expertise and natural wiring. There is a lot of evidence to support the idea that whenever we employ a solution, a decision, a plan or anything else that we conclude ourselves…we’re more likely to follow through and be successful implementing it. That sense of ownership of a solution is important. The best smart guides have an ability to help group members build relationships. The authors cite a story of a peer group leader who conducted a meeting, but 3 days later one of the members had a crucial issue arise. He called her fretting about having to wait another month until the next meeting. She asked him what he wanted to do and he said he’d like to get with a few of the members who he felt might most be able to help him. He asked her if she could help make that meeting happen and she suggested he contact those members directly. The point wasn’t her role, but the member’s need and his ability to forge ahead, even without her (the group leader). The members have a relationship with each other when a smart guide performs well. Passionate leaders have an impact on people. Just think about the people, like teachers, who have had the biggest impact on you. We’re attracted to and more deeply engaged by passionate people. We can tell when people love what they do and are really into it. You may tend to think that a peer advisory group leader is at the center of it all, standing in front of or in the middle of the group. But the leaders the authors spoke with said you can’t lead a peer group that way. At least not for very long. The ideal group structure isn’t one that puts the focus on the leader, but where the attention is on the members and their interaction with one another. The best smart guides aren’t at the head, but they’re among the group. They’re part of the group. The authors have a diagram of a triad where the smart guide, a member and the group are at the three corners holding the relationship in the middle. Triads become essential for effective communication. The smart guide insures that the group understands what’s going on and what’s being said. And the smart guide has the back of the relationship. Everything can’t go through the leader though if the group is going to stay together. Sustaining the group requires a smart guide to help insure that every member and the entire group bear responsibility for holding up their part of the relationship. The leader can’t be wishy washy. A measure of assertiveness is required to maintain the group norms and insure the group culture is positive – enforcing things like confidentiality and safety. Developing a shared understanding of expectations and responsibilities is an essential part of the smart guide’s responsibility. Group meetings can be serious tackling some pretty heavy issues. Smart guides reported the importance of interjecting some fun at times. You may think that business owners or CEOs wouldn’t appreciate it, but that’s not true. This is their time out of the office to work on their business…and to have a bit of fun, too. Smart guides create different ways to interject fun into their group meetings. One group leader mentioned creating a wall space where group members could hang anything of interest they had come across since the last meeting. They could celebrate their findings together. They also celebrated milestones including birthdays or anniversaries. It brought the group closer together. True smart guides lead with a guiding hand of a servant leader. They listen, ask good questions, build camaraderie, consider themselves coaches rather than consultants and wear their passion for the role on their sleeves. In the next chapter – chapter 7 – armed with the right peers, a safe and confidential environment, and excellent guidance, the authors will explore what’s behind the power of these groups and how peer advantage becomes possible. Are you a small to medium business owner who finds all this talk of The Peer Advantage intriguing? Then please email me at RandyCantrell [at] BulaNetwork [dot] com. If you can see the value of being surrounded by other business owners who are committed to growing their companies and their leadership, then I’d like to speak with you to learn more about you and your company. Thanks for listening and next time we’ll tackle chapter 7 entitled, Foster Valuable Interaction.